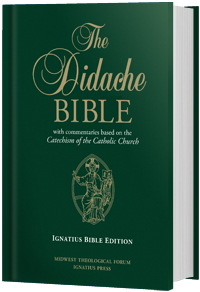 The Didache Bible (RSV2CE) presents extensive commentaries, based on the Catechism of the Catholic Church, for each of the books of the Holy Bible. The Didache Bible also includes numerous apologetical inserts to assist the reader in understanding the Church’s teachings on current issues. The Didache Bible (RSV2CE) is a valuable resource for students and those participating in Scripture studies. Ideal for anyone seeking a deeper understanding of the Catholic faith and intended to be accessible by all Catholics in its level of scriptural scholarship.